Across Central Georgia the economy is gearing up, with existing companies expanding and new ones picking new sites. The region has been winning its share of economic development prizes by offering companies what they need, and at the top of the list is a trained and ready workforce. Central Georgia has gotten the message, and nearly every county – large and small – has focused on upgrading local secondary education and forming alliances with region-spanning technical colleges to offer businesses the employee training they need. Officials note there has been a major uptick in capital investment across the region. Projects that were long in the planning stages are now moving to building and completion stages, according to Laura Mathis, executive director of the Middle Georgia Regional Commission. “We had a period of time where project activity was rather slow across the region, and I think really in the last 12 to 18 months, project activity has picked up considerably,” she says. Counties are also increasingly looking at these projects from a regional perspective and marketing assets that transcend county boundaries. A small county can’t supply the needs of a big plant, but by showing site selection teams the large workforce within an easily drivable multi-county region, a deal can be closed. “Workforce is very mobile, so any type of project, regardless of the size, has an impact that crosses county boundaries,” Mathis says. Local governments and development authorities are “definitely focused on workforce and the skill set to meet the employer demands,” she adds. The success of these efforts is evident in Macon-Bibb County, which attracted more than $800 million in private investments over the last 24 months, says Adams. Recent big successes have included a 1-million-square-foot Amazon distribution center (500 new jobs) and a $400-million, 800,000-square-foot manufacturing facility for Irving Consumer Products. Both are set to open this year. After screening more than 8,000 resumes and conducting 800 interviews, Irving has filled most of its 200 positions. Those on board received training through programs offered by Central Georgia Technical College and the Georgia Quick Start program. The college even provided office space for plant management as the facility was being built. Macon is a hotbed for aerospace, and the county snagged Stevens Aerospace and Defense Systems last year. It plans to occupy a facility at Middle Georgia Regional Airport and create more than 150 jobs. It, too, cited Central Georgia Tech as a motivator for locating in the region. Another existing space is being taken by Embraer, which performs commercial jet aircraft maintenance services out of the airport facility, adding 100 jobs. Two of Macon’s other key industries announced expansions. Graphic Packaging invested $136 million into upgrading a local mill. Tyson Foods invested $59 million to double the size of its facility, adding another 100 jobs. The county has focused on recruiting specific industry sectors to match the area’s workforce and other assets to the specific needs of companies. “Between food processing, aerospace, distribution and warehouse, and manufacturing, we have seen growth in all sectors,” Adams says. Smaller counties in the region are also seeing economic growth. Laurens County scored a major expansion with Valmiera Glass, which is adding 100 new positions to its existing plant that makes fiberglass parts for cars, planes and spacecraft. Oconee Fall Line Technical College stepped up to offer courses to get potential employees ready for these jobs. “They put together a curriculum that included three or four different courses that are specific to the things that Valmiera Glass needed when they got the plant open,” says Guy Cochran, chair of the Dublin-Laurens County Development Authority. The program enrolled about 400 employees for the company, he says. Education, training and retraining are playing a big role in Warner Robins and Houston County. 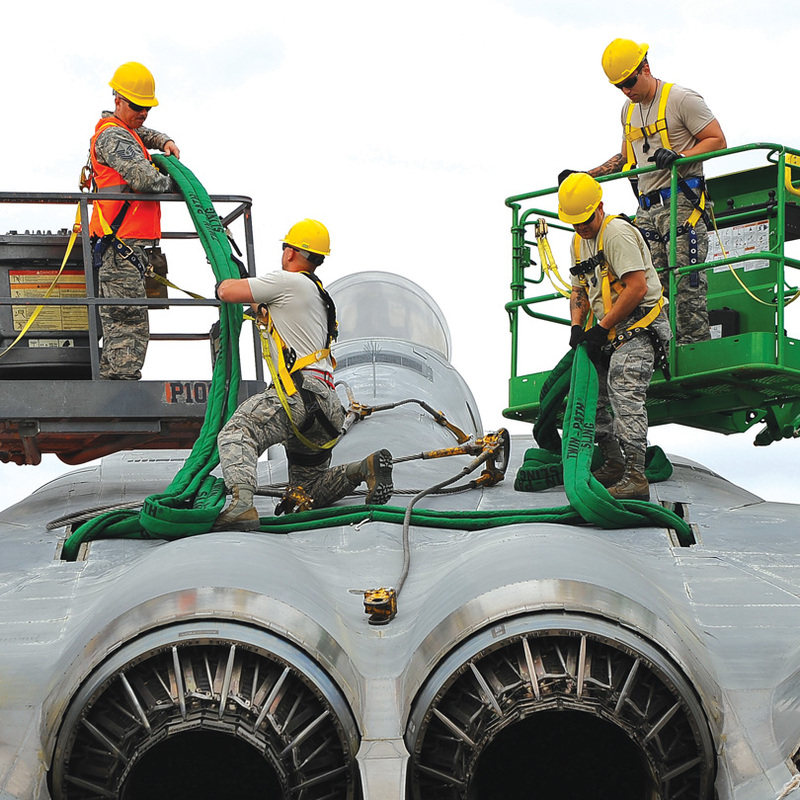 At the heart of the local economy is Robins Air Force Base, the largest industrial complex in the state. The sprawling facility has survived a series of base closure rounds and continues to prove its worth by taking on more missions. It recently embarked on a drive to hire 1,200 people for its Air Logistics Complex by the end of 2019. These include workers skilled in aircraft maintenance and engineering for positions as aircraft mechanics, sheet metal mechanics and electronics mechanics, among others. The base also runs a software development operation for military aircraft. Warner Robins has a one-of-a-kind gateway for veterans to reenter the state’s public postsecondary educational systems and workforce. The VECTR Center provides career counseling, educational coaching and job training in high demand and strategic industries. “The added bonus is a partnership with Central Georgia Technical College, where veterans can go through an accelerated program that would be much quicker than the regular technical college system in several different areas,” says Angie Gheesling, executive director of the Development Authority of Houston County. These certificates and degrees recognize the skills gained through military service, she adds. Houston is one of the state’s fastest-growing counties, with a population that has increased 39 percent since 2000. Last year the county issued more than 900 building permits for new homes. That level of growth is expected to continue, says April Bragg, president and CEO of the Robins Regional Chamber. In Morgan County, Gensteel Doors USA LLC, a maker of steel doors and frames, picked Madison as the site to relocate its warehouse operation. After buying an existing 50,000-square-foot warehouse, the company is bringing its production operations from upstate New York. The operation will create about 30 new jobs, according to Bob Hughes, economic development director and president of the Madison-Morgan County Chamber of Commerce. East of Macon, Twiggs County is home to the geographical center of the state. Although small in population, the county has been successful in winning development deals. The latest of these is a 200-megawatt solar plant now under construction. The First Solar plant will be the largest contiguous track of solar panels in Georgia and the second largest east of the Mississippi, says Judy Sherling, executive director of the Development Authority of Jeffersonville and Twiggs County. While the plant itself will need only about five workers, the construction project is expected to employ 500 to 700 people. Another small county, Ben Hill, is also enjoying the success of business expansions and relocations. “Over the course of the year, we saw the completion of several projects that counted for nearly $30 million in capital investment,” says Jason Dunn, executive director of the Fitzgerald-Ben Hill Development Authority. “We experienced a nearly 50 percent drop in unemployment,” says Dunn, the result of the nearly 150 new jobs. To keep the jobs flowing, the county won a $3-million college and career academy grant from the state. Construction of the Fitzgerald High School College and Career Academy, in partnership with Wiregrass Georgia Technical College, will be getting underway soon, Dunn says. There are few companies as iconic as Blue Bird, maker of the yellow school buses that have transported generations of students throughout the nation. With its corporate headquarters and manufacturing facility in Fort Valley, the company employs nearly 2,400 people in Peach County. “Over the past few years, they’ve been involved in several projects to grow and modernize their footprint in Peach County,” says B.J. Walker, executive director of the Development Authority of Peach County. The latest is a new paint facility. When it’s complete later this year, the $50-million investment will incorporate the latest in robotic paint equipment. In Putnam County, Stair South recently doubled its facility with a second building. The Eatonton-based company provides interior and exterior stairs and railings. In addition, biotech company Aalto Scientific has a $700,000 facility expansion going on, while Bluestem Brands’ fulfillment center is in the midst of a $1.1-million facility improvement project. To help fill the demand for local jobs, Putnam County converted its school system to a charter format seven years ago and created a college and career academy. Today, students can access a wide variety of technical and college classes on the local campus. “A lot of these kids are able to go out and get jobs as they graduate high school,” says Terry Schwindler, director of the Putnam Development Authority. Barnesville’s Continental Tire plant, which has been in Lamar County for 130 years, expanded recently and grew its workforce by more than 100. “They’ve been able to survive, and some of it’s because they have a really great workforce. Some of the folks have been there 40 years and longer,” says Kathy Oxford, executive director of the Barnesville-Lamar County Industrial Development Authority. “That’s huge for a community our size and [for] our region,” she says. Few have done more to educate the public about Macon’s storied musical heritage than Jessica Walden. She owns and operates Rock Candy Tours, which trace the footsteps of the city’s legacy musicians, including Otis Redding, Little Richard and The Allman Brothers Band. Music is in her DNA. She’s the daughter of recording industry executive Alan Walden, who co-founded Capricorn Records in Macon. Ivan Allen has spent a lifetime dedicated to technical education. He’s been at the helm of the consolidated Central Georgia Technical College since 2013, after serving as president of its predecessor, Middle Georgia Tech, since 2005. During that time, he has overseen a fast-growing institution that’s been nationally ranked as Best for Vets and designated as a Military Friendly school. The college also helped create the Georgia VECTR Center, which serves as a gateway for veterans’ re-entry into Georgia’s public postsecondary educational systems and workforce, and was recently awarded a $50,000 grant from the BB&T Foundation for a new workforce initiative focusing on adult education students. • Perdue Farms is expanding its cooking operation in Houston County, a $42-million investment that is creating 125 jobs. • Polar Beverage expanded its operations in Ben Hill County, opening a new 50,000-square-foot distribution center at the end of 2018. • At Robins Air Force Base, a new consolidated mission complex for the Air Force Reserve Command is under construction. The first phase will be a 92,000-square-foot, $27.7-million administrative facility that will be completed this year. • Fiber cement manufacturer Nichiha Corp. plans to break ground on a $120-million manufacturing facility that will double the size of its current plant and create 74 new jobs in Macon.